I had been wanting to make cucumber bowls for quite some time, but hadn't really had the excuse to waste that much cucumber on something that could only have dubious possibilities of success (I have no mandoline, so here, I'm relying on my own somewhat limited knife-wielding skills....). It mostly worked. I ended up having to use bobby pins (washed, don't worry!!!!!) 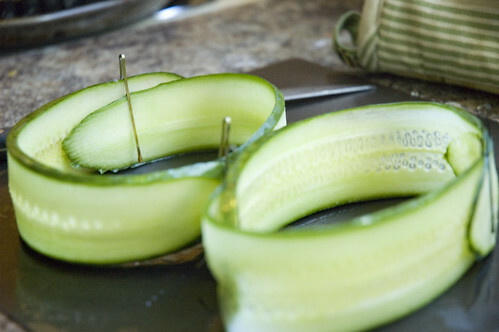 to coax the cucumber into their rounded state, and even then had to resort to one measly little toothpick to keep things in check. The salad in the cucumber bowl was just a very simple combination of arugula and a red wine vinaigrette (due to dieting status, I royally cheated here and use a red wine salad spritzer to help keep the calories down - it would be better with a real vinaigrette, but this was still great). The shrimp were very simple - I bought the size of shrimp where the are 8-12 per pound, but that isn't to say that it couldn't work with smaller shrimp. I think it would also be fabulous with seared scallops. Or even something like tofu if you're not into shellfish. 1. Combine white wine, lemon juice, olive oil, pepper, garlic and rosemary in a ziploc bag. 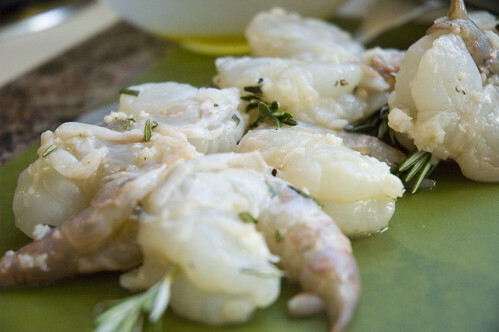 Add peeled shrimp to bag and marinate for about 30 minutes. 2. One sprig at a time, strip all but that last inch of the leaves off each sprigs. Repeat with remaining skewers. Thread 2 shrimp onto each skewer. 3. Heat a grill pan (I don't recommend BBQing this because your rosemary sprigs will catch fire!) over medium high heat. Coat pan with oil. 4. 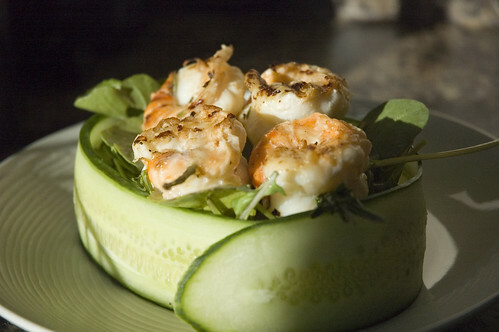 Cook 3-4 minutes per side, until shrimp are done (if you use smaller shrimp, they will cook more quickly).